Here’s a simple tutorial on how to play music/sounds through mic in Rust. It works even while you spoke through the microphone at the same time and even if you didn’t have a microphone to begin with. To achieve all of that, we’ll be using a virtual audio cable, VoiceMeeter and a soundboard. What Are Those 3 Components Used For Playing Music Through Mic In Rust? Virtual audio cable is an audio driver that has an input and an output. Imagine a physical audio cable. Its audio source, the input, would be whatever you plug it into, say a computer. The other end of that cable would be the output, plugged into the speakers for example. Like that, we can hear computer sounds via the speakers all thanks to the audio cable having transferred audio signals from the computer to the speakers. In contrast, imagine an audio driver that acts as a VIRTUAL audio cable, VAC in short. This cable would pretty much work the same way as the physical audio cable. Except now we can choose within the computer what goes into the cable INPUT more specifically, such as some specific audio source for example, and where it is routed through the OUTPUT, to some program that’s designed to receive and process audio signals for example. IMPORTANT: for a VAC, short for virtual audio cable, you have 2 options. Either use the VoiceMeeter’s own built-in VAC or an external VAC from VB-Audio called VB-CABLE Driver. In this tutorial, I’ll be using the VoiceMeeter’s built-in VAC. In case of problems, having read through this tutorial, I’m sure you’ll know almost exactly how to configure the external VAC if it came to that. This can be compared with a physical counterpart too: imagine an audio mixer that processes audio signals. It’s one of those things that has lots of audio cables going into it from different audio sources and then cables going out of it. It takes the audio signals coming in from the incoming cables and processes those incoming signals in various ways. The audio mixer will then channel those processed audio signals to somewhere else through cables going out of it. In comparison, VoiceMeeter is a virtual audio device that acts as a VIRTUAL audio mixer with many inputs and outputs. One such input will be the virtual audio cable I mentioned earlier, but also your microphone. The signals will be processed within VoiceMeeter, both the cable’s output and your microphone’s output signals. Having processed the signals, VoiceMeeter will then channel those signals through one of its own outputs which in our case will be used as a virtual microphone used in Rust to transmit audio signals. 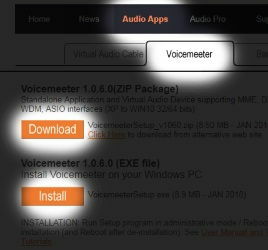 VoiceMeeter also has a built-in VAC, short for virtual audio cable. We’ll be using this to route audio signals from the soundboard into this virtual audio mixer called VoiceMeeter. As the name suggests, a soundboard, in our context a self sustained audio source, is an application to which we load our audio files. We can set hotkeys to each audio file in the application in order to trigger them remotely. Though we can trigger them manually as well. If possible, run a soundboard application as Administrator, that way it gets elevated permissions and is less likely to be ignored when it’s running in the background. IMPORTANT: You can choose a soundboard for yourself in this post: List Of Soundboard Software For Playing Music Through Mic In 2018 (link opens in a new tab); the soundboard used in this tutorial is called EXP Soundboard. If a soundboard is an overkill for your cause, you can replace the soundboard with any configurable audio source (Windows Media Player for example) and instead play the sounds coming from that via the virtual microphone. Audio signals from the soundboard go through the virtual audio cable and end up in VoiceMeeter. At the same time, audio signals from our microphone are also channeled to VoiceMeeter. In VoiceMeeter, the signals get processed and then played through a virtual output, in our case, a virtual microphone for Rust. There’s also a second output from VoiceMeeter. That one goes into our speakers so that we can hear the same things that go into the virtual microphone. We can choose what we want to hear. We’ll choose to hear the triggered sounds but not ourselves speaking through the microphone, unless that’s something what you wanted. We can choose what goes through the virtual microphone and plays in Rust in that same fashion. The whole process of setting it up is fairly simple. Let’s download and install VoiceMeeter and EXP Soundboard (all the links open in a new tab). You can choose some other soundboard if you like: List Of Soundboard Software For Playing Music Through Mic In 2018 (link opens in a new tab). Support for EXP Soundboard was dropped in 2016, so it might not be a butter smooth experience for you with it. 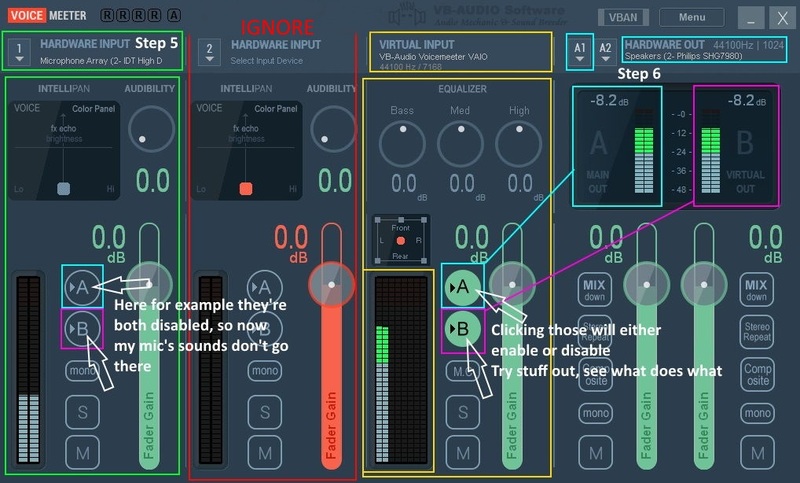 Let’s enable VoiceMeeter Input and Output. 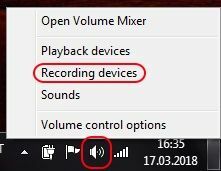 You should be able to find them under Playback and Recording tab in Sound settings. They might be disabled by default, so you might not see them. You just have to right-click and tick the Show Disabled Devices to first see them. While at it, make VoiceMeeter Output your default device so that Steam uses that instead of your Microphone alone. Let’s open EXP Soundboard (or your preferred soundboard). 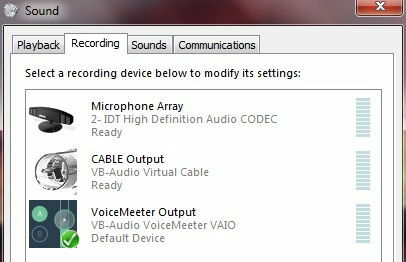 Once opened, select VoiceMeeter Input (VB-Audio VoiceMeeter VAIO) as the 1st Output. In VoiceMeeter, for the 1st HARDWARE INPUT select your microphone. There are options for WDM, KS, MME or even maybe ASIO and whatnot – know that the best one is the one that works for you. For me, that was MME. Still in VoiceMeeter, under A1 HARDWARE OUT, select your main speakers. With this, you selected the A MAIN OUT to be the speakers of your choice. B MAIN OUT is the virtual microphone – you don’t have to do anything with it as it’s aready set and ready. The virtual microphone is the pink VIRTUAL OUT, it’s also VoiceMeeter Output (virtual microphone). Let’s set Steam to use the virtual microphone. Since we made VoiceMeeter Output our Default Device, Steam should be using it already. But to make sure Steam, and thus Rust, is using the VoiceMeeter Output (that in our case acts as a virtual microphone), check Steam’s input preferences. Change it to VoiceMeeter Output if it wasn’t already. Test: insert any audio file to the EXP soundboard and it should be played in Rust as if it came from your microphone were you to trigger the sounds, and that even if you didn’t have an actual microphone yourself. Just fiddle around and try stuff out – knowledge comes with practice. All that you’ve read so far might start to make sense that way! If NOTHING here worked out for you, don’t let it get you down.